Large numbers of Scotch Pies are sold in Scotland every day - they are an original "fast food" and are often sold at the half-time interval at football (soccer) matches. The pies are made in special straight-sided moulds, roughly 3-3½ inches (7.5-8.5cm) in diameter and about 1½ inches (4cm) deep. A pastry lid, inside the pie, covers the meat about ½ inch (1cm) below the rim. This leaves a space at the top of the pie which can be filled, if required - with hot gravy, baked beans, mashed (creamed) potatoes etc. The meat is usually mutton (sometimes of varying quality). Many bakers have their own recipes and add spices to give additional flavour - there is now an annual competition for the best Scotch Pie. Grannie Black, in Candleriggs in Glasgow, was a character who had such a reputation for such good mutton pies that people came from far and wide - the pub named after her (pictured here) has, unfortunately, been demolished. The quantities below should make roughly 8/10 pies.  You will also need glasses or jars, approximately 3-3½ inches (7.5-8.5cm) in diameter to shape the pie. Create the filling by mixing the minced (ground) lamb, spice and seasoning. Make the pastry by sifting the flour and salt into a warm bowl. Make a well in the centre of the flour. Melt the lard in a scant measure of water and, when it is bubbling, add to the flour and mix thoroughly. Take a small amount (remember the mixture should make 8/10 pies, with their tops) and form into a ball and keep the rest warm while making each pastry case. This is done by rolling a suitable amount for each pie and shaping the crust round the base of a glass or jar approximately 3-3½ inches (7.5-8.5cm) in diameter. Make sure there are no cracks in the pastry - you can trim round the top of the case to make it even. As the pastry cools and gets cool, remove the glass and continue until you have about a quarter of the pastry left to make the lids. Fill the cases with the meat and add the gravy to make the meat moist. Roll the remaining pastry and use the glass to cut the lids. Wet the edges of the lids, place over the meat and press down lightly over the filling. Pinch the edges and trim. Cut a small hole or vent in the centre of the lid (to allow the steam to escape). Glaze with milk and bake for about 45 minutes at 275F/140C/Gas mark 1. If the pies are not eaten immediately, they can be stored in the 'fridge but always ensure they are properly reheated before being eaten. Hey wee mags, ur ye tellin' us that ye cin buy scotch roon' pies in USA?......Ye're huvin' us oan int ye? Ah cannae get thim in south east England! Tesco's, M&S, Iceland, Sainsbury's, Asda's huv a' stoaped sellin' thim so ah huv tae wait tae a go hame tae Scotland......but ah've goet tae say, the taste much better fae the butchers in Glesga! Whit ye tryin' tae dae tae me stuarty?......Ye've goet me sufferin' fae midnight starvation noo! awe poor georgia hen a cin get thum in Australia tae dolls,it COsts me 3bucks a pie but sooooooooooooooooO worth it,we get totty scones anawe 3.bUCKS 50 CENTS FURR 6. POOR YOU HEN THATS A SIN SO IT IS,WE EVEN GET IRNBRU HERE AND AWESOARTS A GOODIES BUT YE PAY THROUGH THE NOSE BUT YER BELLY FAIR ENJIYS IT HAHA all products are imported frae greenock in scotland.A Greenock man owns the factory and wee shop,sells hunnerrs a day peeps travel faur n wide tae git thum,the truckies have a stoap ootside his shop noo haha. 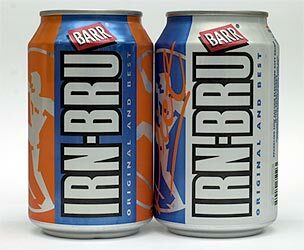 We get Irn Bru and stuff here in Auckland too.... was only the Aussie bottled Irn Bru before, but now we get the dinkum Irn Bru bottled by Barrs and made from girders.... we can get them at an orchard shop which imports UK food. Only problem is, Jaffa Cakes and things like that are just about at their use by date by the time they get here. 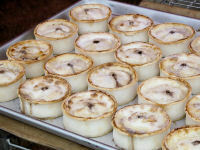 Scotch Pies.... yummm... ah'm gonny have a go at making them myself now I've seen that recipe! Watch this space.... and so much for the diet I was going back to on New Years Day! I'm lucky here in Canada .We have a couple of local Scottish Butchers and Bakers close by .I tend to make my own tottie scones and fruit scones etc . but it's nice to just by pies ready made . We have a wee stall in a local market and they bring in just about anything you could want from food to clothes and video's etc . Recently their prices have gone sky high and if they keep it up they will price themselves out of business . 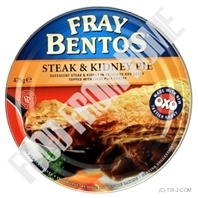 I love Fray Bentos Steak Pie in a tin .I used to bring back a dozen from visits back home .They cost about one pound fifty pence .I think .This wee stall had them on sale for $14.95.That's close to seven pounds .!!! !I know they have to absorb the cost of bringing them in but I just refused to pay that price .Same with OXO's 12 oxo's cost almost five pounds .On a recent visit my family brought me boxes of 24 bought in a discount shop for just under a pound !!!! Why do people get so greedy? Jakka, I buy OXOs in my local supermarket, 24 wee packets for $3.99, I buy both the beef and chicken as I put them into my stews and soups to add extra flavour. I used to buy Scotch pies in M & M Meats but I don't get them very much now. There used to be a good Scotch Butcher in Burnaby when I lived at the Coast, they sold all the different scottish foods, pies, bridies, potato scones, Ayrshire bacon, black pudding etc. my husband used to call in there every Friday night and come home with a huge parcel. He got so friendly with the owners who were Scottish that he finished up as their accountant!! I've got Lee's snowballs, with icecream, cadbury's flake and chocolate or strawberry sauce for those who don't want clootie dumpling tonight, but knowing my son and son-in-laws, they'll have both!